I’m finally excited that something I cooked turned out right! I haven’t felt like I’ve been a very good cook lately, but this bread has brought me enthusiasm. I found this recipe through ‘The Kitchn‘ website. 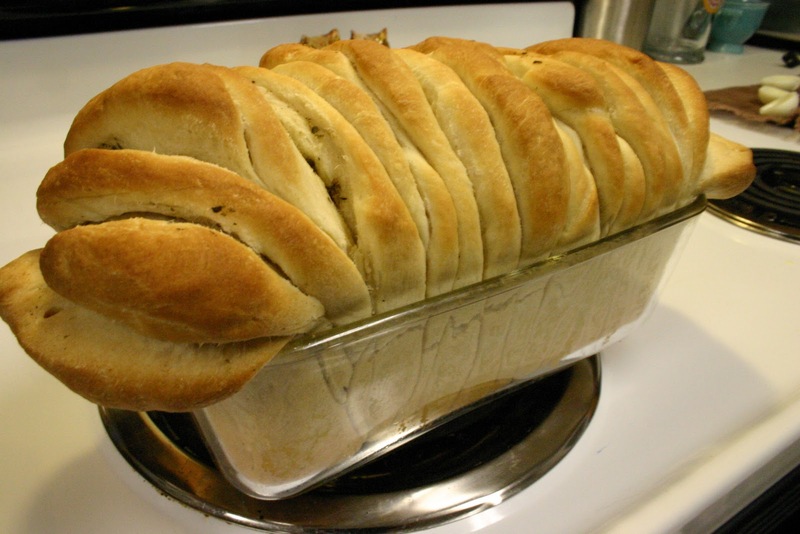 Someone wrote in looking for the lost recipe of ‘pull apart bread’. Someone in the comments ended up having the recipe, so I decided to try it too. The recipe was taken from the blog ‘Dreaming of Pots and Pans‘. I didn’t add the cheese (and used olive oil on the top instead of milk), because I wanted to keep it simple. I also altered the cook time some because I thought the temperature in the recipe was too hot. I think I’ll make this in the future, especially for taking places. 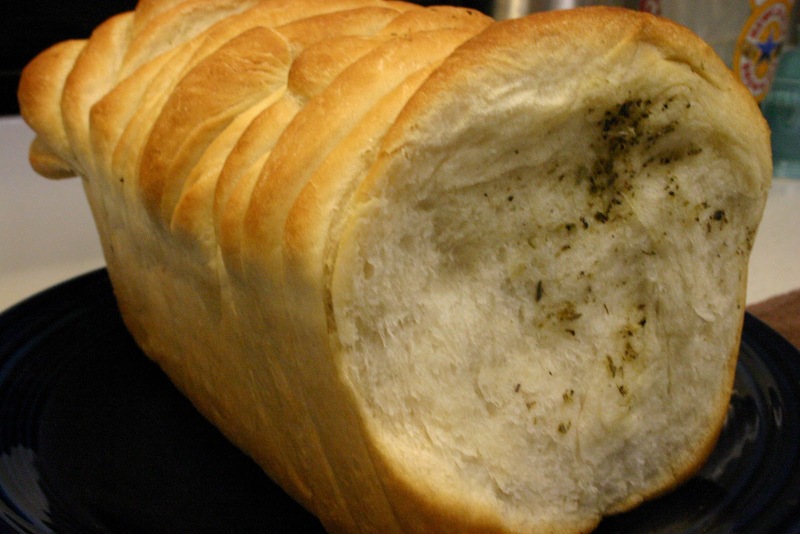 The slices pull right apart which means no cutting, and each piece is really moist. It’s almost like rolls made into a loaf shape. 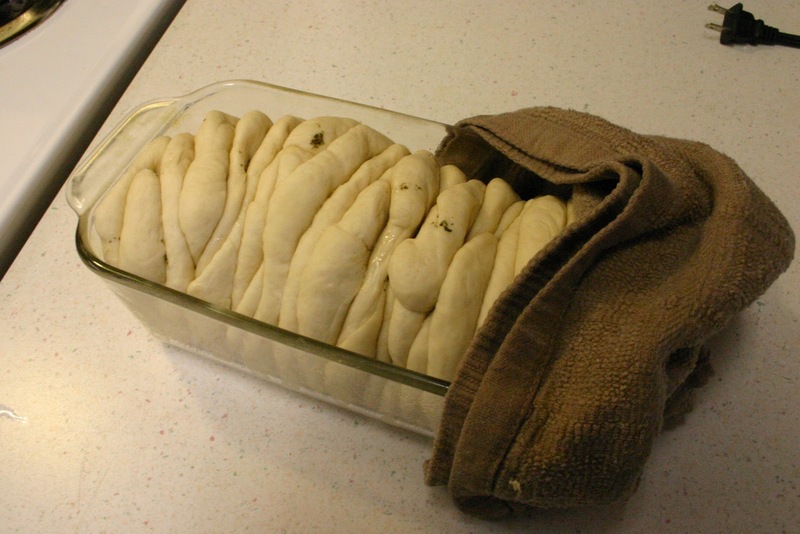 It also came right out of the loaf pan which means it can just be wrapped up without leaving it in the dish. Plus it looks cool and each slice is unique. The hardest part was keeping the discs from falling over while stacking them, and then maneuvering all that sideways into the pan. I imagine you could just put them directly sideways into the pan as you make each layer. In a small bowl, whisk yeast, sugar and 1/2 C warm water. Allow to expand 10-15 minutes. You want the yeast to foam and expand. Sift flour and salt. Make a well in the bowl. Drizzle in olive oil and yeast. Mix well. Slowly add in the remaining 1 C of warm water as needed, until a ball of dough forms. Turn out on a floured surface and knead for 10 min until smooth. Place in an oiled bowl and cover with damp towel. Allow to rise 30-45 minutes for rapid rise yeast. 45 min- 1hr for regular active yeast. Punch bread down slightly. Knead again 2-3 times. Mix together oil, herbs, pepper, and cheese if desired. Cut dough in half and cover one half while working with the other. Roll into a log and make 10 balls from each half. Roll into flat circles, 3-4″ in diameter. Top each circle with 1 tsp of cheese/oil/herb mix. Brush edges with oil. Keep stacking circles of dough. 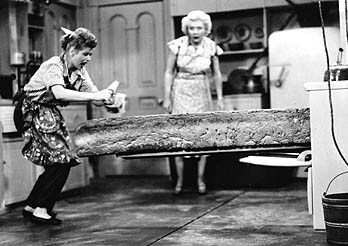 Turn the stack sideways and put in a well oiled loaf pan. Cover and allow to rise 20-30 minutes. Brush with milk and sprinkle with salt. Bake 40 minutes total. Bake 20 min at 400 degrees. Cover with foil. Reduce heat to 325 degrees and bake more minutes.